Industry-oriented certification PPC-Google Adword training course to furnish your career to kick-start/grow at MNCs/Non-MNCs Organization & corporate. Professional expert Sr. B-School Sr. Pre-Sales Consultants With 10+ Years of working experience will provide you industrial level training. What Drives A “Buyer” To Invite Bidders? Detailed Description Of The Terminologies And The Thin Line Of Difference. An Overview Of “Buyer’s” Procurement Department. Various Types Of Proposals And Assessing The Difficulty Level In Responding To Each. Technology Ennoblement Consulting For FORTUNE 100 Healthcare Payor In The U.S. This Sub-Module Will Help Understand The Circumstances Of “Bid” / “No-Bid” Decision Taken By A Bidder. This Will Also Outline The Short Listing Process Of “Buyers” To Invite Prospecting Bidders. 3 Key Questions To Ask, Before The Decision To Bid Or Not. Success story of “Audit and attestation services” for a Startup or Mid-size companies. Efficient proposal production and shipping for a client in West Coast, delivered from East Coast. Sound’s unbelievable. Isn’t it? Identifying stakeholders – the bid preparation team. 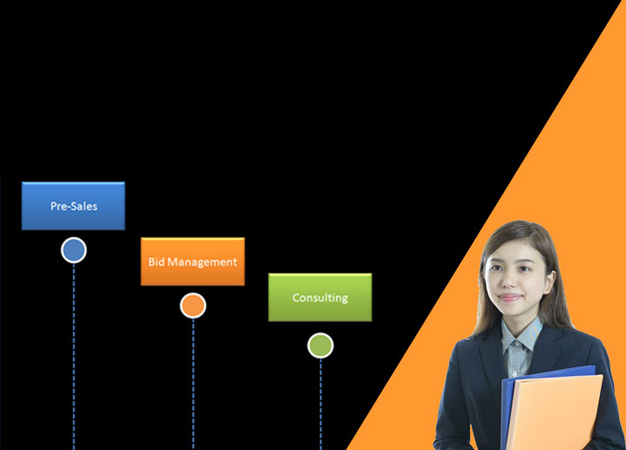 How to prepare a bid response timeline. Why it is so important? Must have – sufficient time for reviews and the “Big” final review. Bid formatting in MS word, excel, and PowerPoint. The impact of graphic elements – charts, diagrams, images, callouts, pull quotes etc. At what stage the summary should be drafted in the proposal development process? What salutation your summary provides and its impact? This module describes why a “Buyer” issues an RFP and why the “Seller” gets the invitation to bid. We will briefly discuss about the sales cycle (including collateral development) in an enterprise solution/services perspective. Sales and opportunity pipeline management.